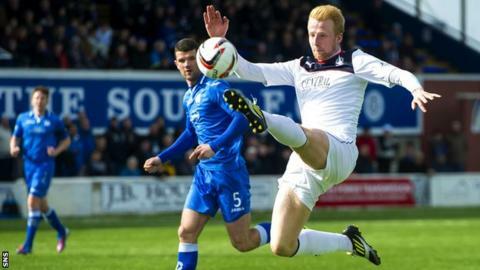 Falkirk beat Queen of the South to go to within two points of second-place Hamilton Academical in the Scottish Championship. After a scoreless first half, Blair Alston struck to give the Bairns the lead and Mark Beck quickly fired their second. A shot by Gavin Reilly reduced Queens' deficit midway through the second half. Jonathan Flynn was sent off for the visitors following a foul on Iain Russell but Gary Holt's side held on. Match ends, Queen of the South 1, Falkirk 2. Second Half ends, Queen of the South 1, Falkirk 2. Blair Alston (Falkirk) wins a free kick on the right wing. Foul by Paul Burns (Queen of the South). Corner, Queen of the South. Conceded by Craig Sibbald. Corner, Falkirk. Conceded by Chris Mitchell. Mark Millar (Falkirk) wins a free kick in the attacking half. Corner, Queen of the South. Conceded by Conor McGrandles. Attempt missed. Gavin Reilly (Queen of the South) right footed shot from the centre of the box is close, but misses to the left. Lewis Kidd (Queen of the South) hits the left post with a right footed shot from the centre of the box. Mark Beck (Falkirk) wins a free kick in the defensive half. Attempt saved. Iain Russell (Queen of the South) right footed shot from the centre of the box is saved in the centre of the goal. Jonathan Flynn (Falkirk) is shown the red card. Foul by Jonathan Flynn (Falkirk). Substitution, Queen of the South. Lewis Kidd replaces Ian McShane. Goal! Queen of the South 1, Falkirk 2. Gavin Reilly (Queen of the South) right footed shot from the centre of the box to the bottom left corner. Assisted by Chris Higgins. Chris Higgins (Queen of the South) hits the bar with a right footed shot from the centre of the box. Corner, Queen of the South. Conceded by David McCracken. Attempt missed. Mark Beck (Falkirk) header from the centre of the box is just a bit too high. Stephen Kingsley (Falkirk) wins a free kick in the defensive half. Attempt saved. Mark Millar (Falkirk) right footed shot from outside the box is saved in the bottom left corner.